NPR ran a video game ratings story a couple days ago and got nearly everything right. I'm calling that notable because the mainstream news media so rarely does. The only troublesome bit may be the writer's description of Modern Warfare 2 as a violent game in which you "hunt down Russian ultranationalists with machine guns, sniper rifles and grenades." I realize that's basically accurate, but it's also a bit like saying The Hurt Locker is a violent film about a bunch of adrenaline junkie Army IED disposal wonks, full stop. The rest of the story highlights what we've said in the games biz for years: When it comes to subjective cultural tags like 'violence' or 'strong language' or 'sexuality', self-rating (not to be confused with self-regulating) works. In fact it works better than I suspect anyone expected. A 2007 Peter D. Hart Research Associates study found that nearly 90 percent of American parents with kids who play games are aware of the Entertainment Software Rating Board's system, while some 85 percent actually use it. You can't beat numbers like that. And I'm glad to see NPR ends on an up note, plugging the Federal Trade Commission's assertion that the video games industry "does a lot better shielding kids from violence than the movie and music business do." 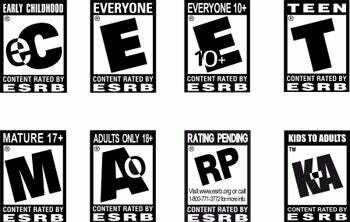 No, the video game ratings system isn't perfect. Nothing is when you're talking about stuff like "cultural values," which, no surprise, vary wildly in the US. The ESRB offers the best advisory tool available, as different studies approaching the subject from various angles have shown time and again. And that tool's improving daily. The ESRB recently released an iPhone app that puts the whole ratings database--some 18,000 games, crazy as it sounds--at your fingertips. Don't have an iPhone or iPod Touch? Park your mobile phone's browser as m.esrb.org for a handheld-friendly version of the site. With tools like that and the ratings featured prominently on every retail box, if kids are still managing to access material their parents don't want them to, it probably says more about parenting skills than anything.